Boarding houses are established to protect children from IDP (internally displaced people) areas within Burma. Children arrive, often unaccompanied, in the refugee camp to seek protection from the violence within Burma and to receive an education. Many of the children become workers during their pre age. There are a lot of the migrant parents workers who can not protect their children to seek for education. Children’s future is becoming a candle in the falling rain. As a Karen people from Burma we are seeking for peace and justice to change the situation in Burma. But it already more than 60 years, our dream is wandering in the air and we are living in the imprisonment of injustice. The only effort that we can make for our future generation is just to protect them for gaining the skill and receiving education. We now would like to establish a new dormitory, especially for the Karen people whom no one care when they attend the Thai school. They are not refugee, they don’t know who they are, they can’t read and write their own language, they don’t know how to dream, they don’t finish the high school, they can’t go to the university, they don’t receiving any care and health and they don’t even receiving the parent’s care. Can read and write is the only motto that enough for their whole life. Children should communicate with their wishes and feeling effectively for their vision. We would like to let them carry the candle with light toward their goal for gaining the high school certificate and degree in any field. week the children arrived. The project budgeted for less children than have come! There is funding for a dozen children but 26 are living in the dormitories. It costs about 1000 baht (US$ 30 NZ$50) per child per month. If you would be willing to sponsor a child do contact me. Since late September there have been a number of reports of increased activity by the DKBA (a Burma/Myanmar Army front force). 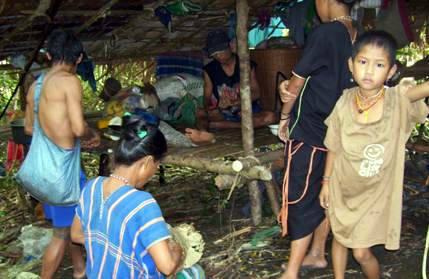 On several occasions villages have fled across the border into Thailand. There are some reports of attacks into Thailand. 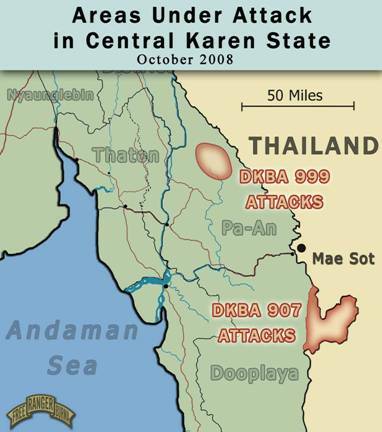 Since the 21st September the DKBA (Democratic Karen Buddhist Army, who are allies with the Burma Army) have attacked a number of Karen villages inside Burma. The villagers are now not allowed to leave without permission. Villagers are being used as forced labour and minesweepers. So far, four people have stepped on landmines – two have died from their injuries. Over 250 people in surrounding areas have fled to the border near Mae Sot, seeking safety. More are expected to arrive in the next week or so. Partners has been able to immediately supply rice, medicine, knives, cooking pots, mats, blankets, mosquito nets and stoves to those who are in desperate need of help. Prayers and practical help are needed! The photo and map are from the FBR report, which gives much more detail.